® encoded bitstreams, and includes modern interfaces. This allows it to be used everywhere in a broadcast, cable, satellite, or post production facility, and even to verify the signals received by the viewer's home theatre system. A device that enables testing in all these environments is as useful to an audio engineer as a digital multimeter is to an electrician. The Linear Acoustic® MT2000 Multichannel Bitstream Analyzer is one such solution. It accepts signals via AES, 3GHz SDI, MADI, and DVB-ASI* interfaces, and even supports TOSLINK optical and HDMI* consumer connections. The unit identifies the format of the selected input signal and when appropriate, activates the built-in Dolby E, Dolby Digital or Dolby Digital Plus decoder. Analysis capabilities include error detection at the AES3 layer and within the coded audio layers, including SMPTE 337 formatting information and Dolby E guard band position. Display of the full set of bitstream configuration and metadata parameters contained within Dolby bitstreams is also a standard feature. In addition to displaying audio signal statistics and metadata, the MT2000 includes ITU-R BS.1770-1/2/3 loudness measurement with selectable Dolby Dialogue Intelligence to support ATSC A/85 and EBU R128 measurements. User configurable alerts are supported to monitor for conditions such as: the loudness measurement being either over or under a threshold, the center channel measuring too low, which indicates a possible loss of dialog, silence detection, loss of reference, or other stream error conditions. The MT2000 is capable of generating two-channel PCM test signals with a user-selectable output waveform type (sine wave, white noise, pink noise, or frequency sweep), amplitude, and frequency. In this mode, the amplitude and frequency of each channel is independently adjustable. Test signals and analysis are also provided for latency and basic lip sync. Basic video signal generation is included as well to support creation of SDI output streams and lip sync testing. Additionally, an extensive set of useful Dolby Digital, Dolby Digital Plus, and Dolby E test bitstreams is stored internally. 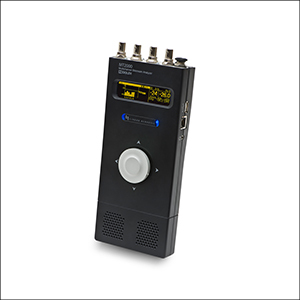 The MT2000 can output the selected test signal or bitstream simultaneously on all output connectors, even while receiving and decoding an input signal. Signals are output simultaneously to the AES and TOSLINK optical connections and can be re-embedded into any of the SDI pairs. The output can be the original input signal, a PCM decoded version of the input signal, test signals, or, in the case of the SDI or MADI outputs, a combination of all of these. Inputs can be used as sources for embedding even if not used for decoding, thus channel shuffling can be easily accomplished. A bright yellow OLED display and integrated rotary encoder/joystick provides straightforward menu navigation and parameter adjustment. A standard 1/8-inch stereo headphone jack can be switched to monitor any two channels or a downmix of a decoded Dolby signal. A digitally amplified speaker provides a surprisingly loud output useful for quick checks and for emulating sound systems found in portable devices. A recent software update adds support for several new features including: EBU R128 loudness measurement mode, multichannel PCM input support, and a 16-channel "discovery" mode. This mode simultaneously displays all of the audio channels contained in a SDI stream or the contents of a MADI stream in groups of 16. Additionally, a completely new menu structure significantly streamlines and eases operation. The MT2000 is powered by an internal NiMH rechargeable battery pack or from its DC power port via an included universal power supply. It ships with a carrying case and multiple adapters.